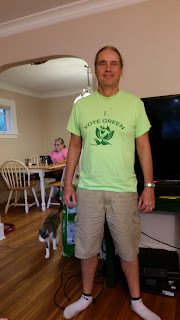 I voted Green this morning, in the first few hours, so that is done. I reviewed the positions of all the local candidates for Council, school board and community college board. I voted against more bonded debt for more roads. I got some smiles for my I Vote Green t-shirt, and some folks rigidly averted their gazes. The Internet was down in a lot of places last week, a distributed-denial-of-services (DDS) attack. The hackers found a huge network of linked computers to hack and exploit for this attack, Chinese Security Cameras, zillions of 'em, everywhere. Presumably, they were not watching us, while they were distracted by this other project. "Internet of Thangs", ya'know? I'm sure it will be all cleared up by Thursday. Smartmatic voting-machines "SUSPECT"? Oh, No! At least they don't use 'em here in Texas. "Ungovernability" is another essay by Ilargi, at The Automatic Earth. Political and economic systems adapt until they snap. That adaptation has been promises-of-a-better-tomorrow for a long time now, and things have limped along, getting worse for most people, but there's that 401k, and the house-value, and Social Security, and the US dollar is strong, so Wal-Mart stuff is cheap. The complex bureaucracies of globalism and vast central government are extremely expensive, inefficient, and often completely against the interests of the people who feed them, us. When growth stops (as it did, years ago) in a system predicated upon growth, only promises can hold it together, and those are wearing thin. Any shock will do for the US Empire, the UK, the EU, Global Financial Capitalism. How much worse will that feel for each of us? All of our current systems can only work against us as they are now configured. This may be the biggest reset in human history. Really nice essay, I really like the style of writing them. But you know, personally I prefer to buy cheap essays online and dont spend a lot of time on it. Thanks a lot for sharing!